Who or What is the Digital PIMP? 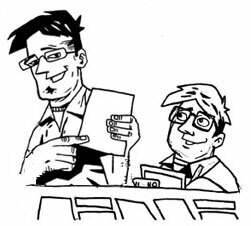 In an effort to keep producing comics, Joe and Phil turned to the vast frontier of the Internet and posted their comics on the web, inadvertently stumbling into what would eventually be known as “webcomics”. Shortly thereafter, they were joined by Irvsher Fabor and Kevin Gleason who created their own webcomics under the Digital PIMP umbrella. If you’re wondering where the name “Digital PIMP” comes from, you only have to look as far as a college aged Joe and Phil walking out of the Matrix for the first time. Jokingly, they suggested they call their company “Digital Pimp” after the throwaway line “The digital pimp hard at work” in the movie. They had always intended to go back and replace it with a different, better name but never got around to it and the name just kinda stuck… so here we are. Digital PIMP. But hey, you’re not gonna forget the name, are you?